2013 La Spinetta, Barolo, Campe, Piedmonte, Italy. Giorgio Rivetti’s Campe Cru Barolo is from 50 plus year old vines at 280 meters of elevation set on the calcareous or marl soils of the region, he’s been crafting exotically styles Nebbiolo from this site since 2000, and every vintage shows it’s sense of place and makes for an intense version of Barolo. I was luck to meet Giorgio in 2002 and got to try his barrel sample of the inaugural 2000 (vintage) prior to bottling and release, and it was fantastic even then and has since even got better, not bad for a first try, and this 2013 reminds me very much of that experience, it’s unmistakably Barolo, terroir driven, but somehow truly a La Spinetta wine with an inner beauty and luxurious in the same way a Grand Cru Burgundy is, though with a powerful impact, the ripe vintage helps soften the tannic blow, without taking away it’s classic structure and form. Rivetti has kept the modern and sleek formula for this wine, it sees 100% new French barriques and is aged a full 24 months, then bottled unfined and unfiltered with another year of resting before release, it always seems to please and surprise for it’s delicacy, complexity and perfume, you know there’s new wood, but it doesn’t influence it’s over all character, with this 2013 you’ll be able to enjoy it much sooner than the 2010, while it still will age, it potentially will be just as good, as that is saying a lot, this is a gorgeous wine and one I hope to revisit at 5 year intervals for the next 25 years! 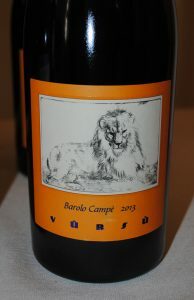 The Campe shines in the glass with a bright ruby tint and the nose shows a mix of roses and violets, dusty cherry and hints of vanilla and cedar before a medium/full palate of youthful Nebbiolo purity with dark damson plum, more cherry, balsamic dipped strawberry and tart currant fruits, minty herb, a restrained game note, discreet smoky vanilla and anise along with kiss of framboise liqueur. Still an infant, though open and transparent, there’s much more concentration than 2011 or 2012, it is way more a normal classic version and way less tight than 2010 and not as fruity as 2009, in other words, it’s just about damn perfect! It’s always tough to chose between the Starderi Cru Barbaresco and this richly textured Campe, both wines have a deep personal meaning to me, and both are rocking in 2013, but while my heart leans towards Starderi, I think this Campe Barolo might be getting the edge, drink it from 2024-2036, it’s majestic and I think it is on par with top Burgundies like Rousseau’s or Dujac’s Clos de la Roche(s)!